I missed my hometown library’s book sale in Newtown, Connecticut this year. 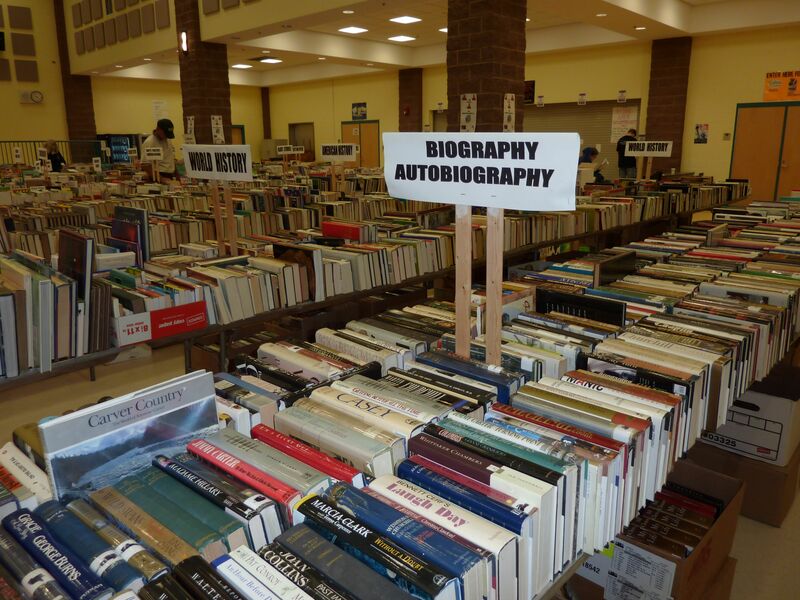 120K books for sale, and I missed it – darn! A few weeks later I happened to visit the Martin Luther King Library in San Jose, California. The downtown library of the 10th largest U.S. city is about a zillion times bigger than the library from my teeny hometown in CT. As luck would have it, I wandered in when they were having a book sale. Whereas Newtown’s library volunteers work all year round to sort and price the books for a large annual event, the San Jose volunteers use a small outdoor space to sell books several times a year. The Newtown sale also relies heavily on donations. The San Jose library accepts books for donations, but also uses the sale to purge the stacks. The approach is different, but hopefully just as successful at raising funds to support the library. As I perused the books in San Jose, I noticed that there was an entire box of biographies that had been marked as library discards. I didn’t recognize any of the titles, authors, or subjects, but picked up one book that looked like it would be out of print. I didn’t read it too carefully, but it seemed to have been written by someone who had been in silicon valley back when silicon valley was farmland and called “The Valley of Heart’s Delight.” I didn’t get the impression that the person was famous, but clearly he or she had enough gumption to right about his/her life. I put the book back in the box, convincing myself that “I didn’t need any more books,” but now regret my decision. I don’t know who wrote that book, but they clearly wanted to share their life with someone like me since they took the time to write it. It’s easy to find a book on famous people. If you can’t find one book on a person, then you can always find another. It’s the everyday people that don’t usually get the chance to tell their story, but are equally part of history. Library sales are a treasure trove for obscure memoirs. I suppose e-books and the various book-scanning efforts will help preserve the memoirs of more recent authors. In the meantime, I wish that I had bought the book I saw the other day. At the very least, I’ll go back to the next Newtown, CT or San Jose, CA library book sale. « Penguin To Acquire Self-Publishing Company Author Solutions, Inc.